From fishing to oil and gas excavation, the sea is a hub of human activity that has far-reaching consequences on marine life. In recent years, as the green revolution kicks in, a new human activity is taking place in Europe’s seas – the construction of offshore wind farms. A new study has found that many species of marine life can benefit from the presence of an offshore wind farm once it has been constructed. Mussels, anemones and crabs are among the sea creatures that can benefit from the presence of an offshore wind farm, the study published in Environmental Research Letters said. Some fish species can also be attracted to an offshore wind farm, while bird species can be deterred, researchers found. 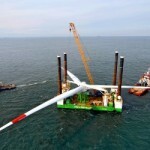 The study is the result of a two-year monitoring programme in place at the Egmond aan Zee wind farm in the Netherlands – the first Dutch offshore wind farm to be constructed. The farm is made up of 36 Vestas turbines situated between 10 and 18 km off the Dutch coast. “Overall the wind farm acts as a new type of habitat with a higher variable biodiversity”, the study said. Some fish species, including cod and pouting, find shelter inside the farm while mussel larvae attach themselves to the monopile foundations of the turbines. Over the two-year investigation period, more porpoise clicks were recorded inside the farm than outside, probably due to a lack of fisheries. Meanwhile, an increase in sole, whiting and striped red mullet was recorded, but a decrease in lesser weever. Before its construction in 2006, the area where the wind farm now stands was part of the heavily-fished Dutch coastal area.